I could never summarize today’s trip in a single sentence, so here goes. 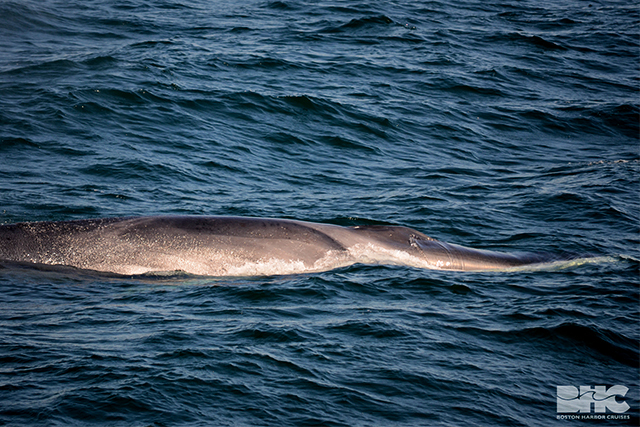 Our first sighting was an absolutely gorgeous fin whale with it’s immense size that could be appreciated as it swam along parallel to the boat. Our last good look including a well-lit view of the chevron, or markings along its right flank. The photos taken will help to identify this whale- with today being so early in the season, it will be interesting to see if we watch this whale throughout the summer. 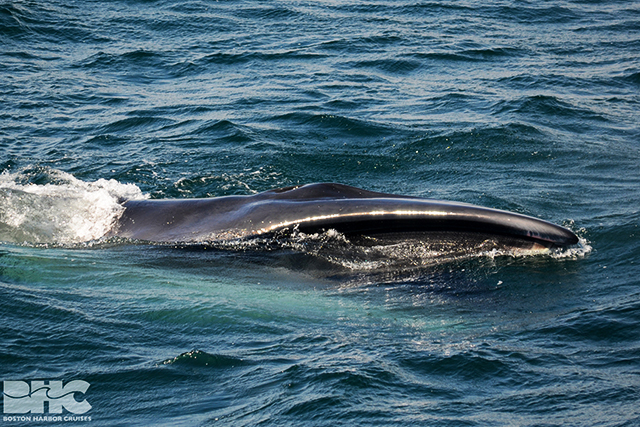 Before long, we thought we were joined by a second fin whale. 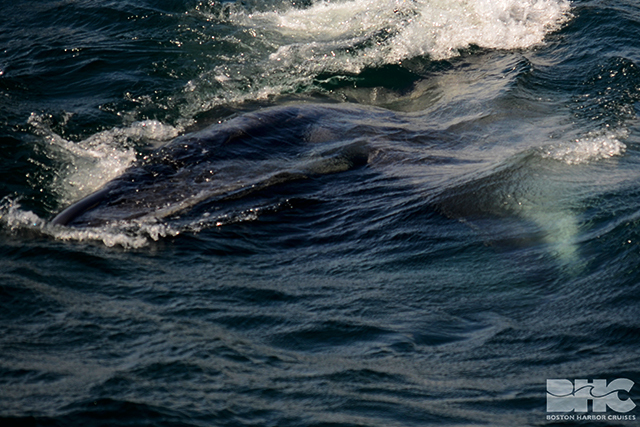 This animal, however, was spending much more time cruising just below the surface of the water-characteristic of a sei whale. It’s ghostly shadow was so cool to watch before it would finally reappear. Before long it was joined by a second sei whale, and each individual was soon joined by a partner and we had a pair on either side of the boat! 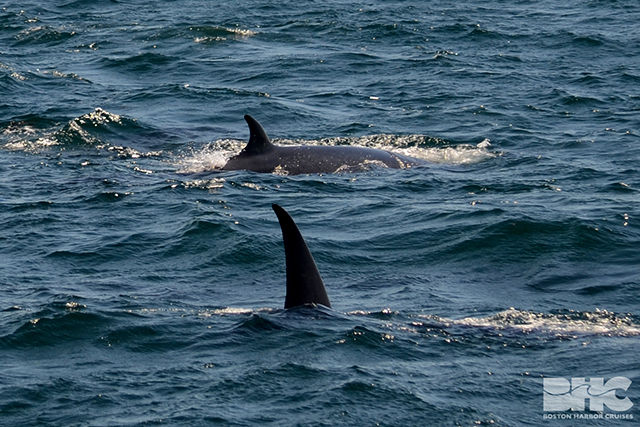 We were escorted by these whales in the direction of a frenzy of diving gannets and whale spouts. Before long we were completely surrounded—literally—by lunge feeding sei whales. They would cruise at the surface skimming along, and then roll onto their side, ventral pleats expanded, in some of the neatest looks at feeding you could ask for. One photo shows the lower (white) jaw at an almost 90 degree angle from the top in one of the many instances that we found ourselves almost looking straight on into the mouth. Humpback whale Sundown added to the mix with a bit of bubble net feeding. She would lift her fluke high out of the water before her series of bubbles would rise to the surface, however things got so crazy I lost track of her in the melee of the other activity. 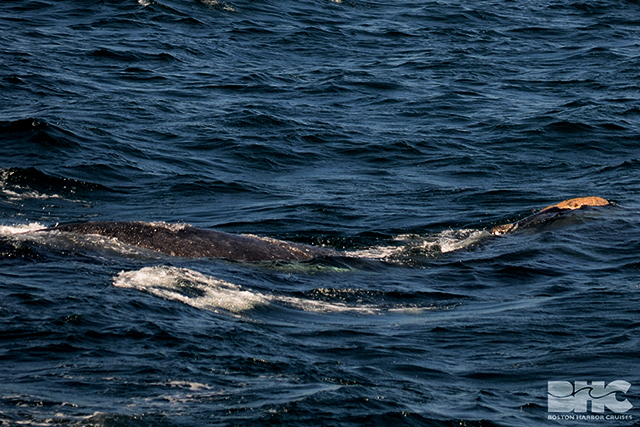 Not only did we have our cameo humpback sighting, but a noticed a right whale skim feeding alongside the seis! This whale was so neat to watch- it was doing this sort of serpentine behavior of arching its back, then lowering it while lifting its head and fluke out of the water. I’ve taken a close look through my photos, and while this particular whale does exhibit entanglement scars, it did not appear to have rope or other gear present today. Another interesting find back at the clubhouse was a photo of a myriad of scars left behind one sei whale’s body from cookie cutter shark bites. 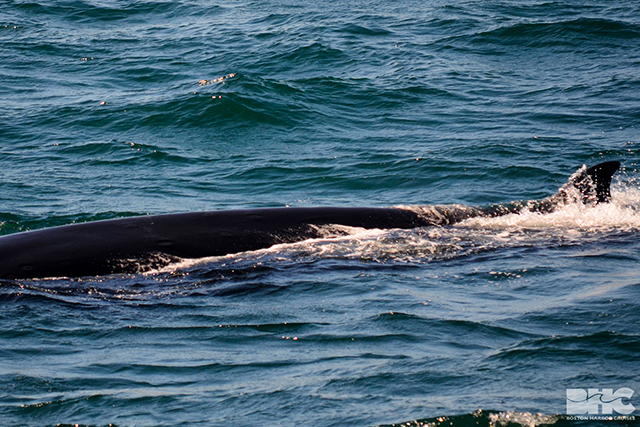 We capped the day off with a fifth baleen whale species and the token minke whale. Today’s trip was complete sensory overload in the best way and I cannot believe how lucky we were. Coming off a weekend of workshops and meetings with scientists and naturalists this weekend, it was such a thrill to be on the water. Please enjoy the photos as much as I enjoyed taking them!